It takes hard work to prepare a lesson plan and teach a class. Even though a trainer might put a lot of work into a lesson, there is always room for improvement. A great way of improving class lessons is by accepting feedback about the lesson trainer and the class itself through anonymous methods to encourage candid feedback. With that in mind, any trainer would make a smart choice by using the Training Evaluation Form Template to create a survey in Microsoft Word. The trainer could then use that survey to gather information about how their lesson was received. First, you’ll need to download the free and easy-to-use Training Evaluation Form Template from this site. Then, open the template in Microsoft Word in order to view it. Once the template is open, make any necessary changes to the template, which is fully customizable. At the very least, you will need to input the trainer’s name at the top and the company’s name at the bottom. Lastly, you will simply need to print out enough copies to give to your class and then give them out at the end of your lesson. 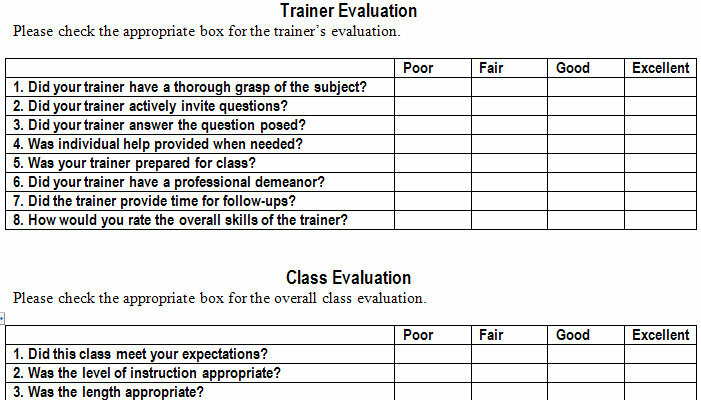 Make sure that the questions in the Training Evaluation Form Template will draw answers that will help improve the trainer’s teaching methods. If you would like to ask different questions using the template, feel free to swap the template questions out for others. If you would like to ask more questions than just the eight provided, all you have to do is go to the bottom-right cell, click inside of it and then hit the ‘tab’ button. This will create another row in which you can ask a question. Lastly, ensure that the instructions are applicable for your situation. For instance, the template provides a space for “Branch Number”, but this could easily be changed to a more appropriate title if necessary. Giving the class clear and appropriate instructions on how to fill out the form will yield the most helpful answers. Constant improvement is important to every professional’s development. 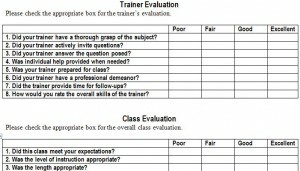 Using this free Training Evaluation Form Template will allow you to improve your training methods and your lesson plan.